VMware – Misc | Welcome to The Virtually Connected! Dell EMC and VMware invite you to Star Wars: The Last Jedi. Watch our heroes transform and learn about the future of digital transformation with the Dell EMC VxRail/VxRack SDDC appliances powered by VMware vSphere 6.5, vSAN 6.6 and VMware Cloud Foundation. Transform your data center with a fully integrated, pre-configured, and pre-tested hyper-converged solution. Whether your datacenter needs are large or small, Dell EMC VxRail and VxRack SDDC are the easiest and fastest hyper-converged options to stand up or extend a VMware environment while dramatically simplifying IT operations and lowering capital and operational costs. Together, Dell EMC and VMware bring you highly configurable solutions to enable your digital transformation. Be sure to register soon, limited availability in each city! Back about two years ago I took a NSX Bootcamp. After the bootcamp, I wanted to create a cheat sheet for myself since I don’t have a networking background and it was the first time working with NSX. That way I had something to look at later to refer to as a reminder. So I created these two pages where the one is a “simple” logical view and the other is a more detailed logical view. Although I created this two years ago, it covers the core components and concepts of NSX, so it is still accurate and relevant to the latest versions of NSX. The detailed page (shown in the picture above) shows all the components of NSX, each component’s function, the intercommunication between them, what plane (Management, Control, or Data) they are in, etc. I think most individuals will find it useful, especially those that are new to NSX. If you have any questions on the PDF that my overview video doesn’t answer, feel free to email me from this site. New Content – vSphere 6.5 Upgrade/Migration & VMware Posters Links! Upgrade/Migration & VMware Posters Links! Many VMware customers tend to wait to upgrade to the next version for several reasons. Some of these are no time to do the upgrade, scared of issues that may arise during the upgrade process especially from vSphere 5.x versions, or wanting to wait until the first update is out so that all the fixes have been addressed. These are all valid concerns in which I can appreciate due to my operation experience and background supporting vSphere environments! On July 21, 2017, VMware released vSphere 6.5 Update 1 which has many enhancements. Once of the enhancements that most are excited about is the fact that the new HTML5-based vSphere Web Client is now at approximately 90% feature parity to the old Java-based vSphere Web Client which was know for being slow and clunky. Hopefully, by the next update of vSphere, the HTML5 client will be at full feature parity. At which time, VMware will retire the old Java-based client. The HTML5 client enhancements are just one of numerous reasons why you should consider updating to vSphere 6.5. Another primary reason is that there are many new featured within the vCenter Server Appliance (VCSA) like embedded Backup/Restore Tool, vSphere Update Manager is embedded, and the new vCenter Server Appliance High Availability (HA) configuration option. So there are some great enhancements that should encourage you to upgrade to the latest version of vSphere and vCenter server! VMware has created a Migration Assistance Tool to help migrate your vSphere 5.5/6.x environments to the new vSphere 6.5. Even if you are currently running a Windows based version of vCenter in the older version, the tool can migrate the vCenter database, performance data and metrics, etc. to the new vCenter Server Appliance 6.5. There are several supported migration options based on your vCenter server, Single-Sign-On (SSO), or Platform Service Controller (PSC) architectures you may be currently running. So take a look at my Useful Links page on this site to see the links to below resources that can help you migrate to the new vSphere 6.5! Click here to go to the Useful Links tab within my website! From August 27 – 31st, 2017 , VMware will be the hosting its infamous VMworld US 2017 conference that everyone waits all year long for! It is an incredible opportunity for VMware’s customers to find out about upcoming and newly released versions of our software. Many of our customers come to listen and learn from all the great presentations from VMware’s own as well as guest speakers to absorb all the information they can while at VMworld. If you would like to register for VMworld US 2017, CLICK HERE! Another major reason for our customers and partners to come to the VMworld conferences is the Hands On Labs (HOL)! The VMware Hands-On Labs demonstrate the real value of VMware solutions in real time. As a VMworld attendee, you’ll gain special access to the latest VMware technologies without being required to purchase equipment, software or licenses. You’ll explore a wide range of today’s most exciting topics with a VMware-provided machine or your own device, all with product experts on hand to provide one-on-one guidance. Earn CloudCred points for taking labs, visiting HOL Connect and interacting with product experts, and win prizes for each level of achievement. And the best part is that anyone can register for an account and access the labs from anywhere with an internet connection! NOTE: The newly updated versions of the labs at the VMworld Conference are usually released to the public facing HOL site for customers within a month or two after the VMworld conferences are over. Register for a Hands On Labs Account: Click Here! I have been working for VMware for just under (4) years now and have participated as a Hands On Labs staff member the entire time. Because of being a staff member, I have attended all the Partner Exchange (PEX) and VMworld US conferences during that time. This year I get the honor of going to VMworld Europe (Barcelona, Spain) for the first time as a lab captain! Without a doubt, I can say that it has been an incredible experience working in the HOL! The entire staff except a very small amount of the staff work the labs as volunteers. Everyone of us dedicate our spare time to work on creating the numerous labs or supporting them in one way or another. We do this because we are honored to be a part of a great team and we love what we do. Working with this team is an honor for me as well as the others I am sure. The knowledge and experience of the staff can be overwhelming to me at times, just an incredible group of individuals. But everyone brings something to the table and contributes to make it an incredible event that our customers and partners want to come to on an annual basis. Another aspect we love related to supporting the HOL is the privileged of meeting our customers and partners that come into the labs. It is a learning experience as much for us as it is them! We also offer Expert Led Workshops where you get one-on-one time with us as we run through our labs and the associated technical information on the product. But sign up for them NOW, because the slots are usually filled before VMworld starts. You do have the option to sign up on the waiting list for a workshop in the event someone does not show up for a particular workshop. So I highly recommend that if you are attending either one of the VMworld 2017 conferences, that you come into the HOL and take at least one of our labs or workshops! While you are there, say hello to me, I will be there supporting my labs! For all those VMware techies out there that work with VMware solutions on a daily basis, it’s hard to remember everything we need to know related to the many solutions we manage. So VMware has created several VMware Reference Posters to help us out when we need a little reminder as far as a command-line argument, configuration option, etc. At the VMware provided website, they have provided us with (3) reference posters for working with PowerCLI 6.5 R1, vCenter Server Appliance (VCSA), and Platform Services Controllers (PSC) Topology Decision Tree. Click on the below link to go to the VMware Reference Poster site and download your copy of these great tools! Although not listed in the above site, there is also a NSX Reference Poster that is also available! So for those that are managing VMware NSX, I highly recommend you download this poster and keep it handy, I am sure you will need to use it at some point in time while managing NSX. The dimensions for the NSX posters are designed to be printed in a high-resolution A3 size (no lower than 300 dpi). NSX Reference Poster (Printable Version): Click Here to Download! NSX Reference Poster: Click Here to Download! Ready To Be A Top Gun? Top Gun Tech Thursday’s Schedule Released For Q2!! Ready To Be A Top Gun? Top Gun Tech Thursday’s Schedule Released For Q2!! Are you ready to be a VMware Top Gun? Join us for Top Gun Tech Thursdays to receive best in class partner SE training! See a Demo (and learn how to do it yourself), get our most frequently asked questions (and the answers! ), and ask an SE any questions you have on the product! Step 2 -­- Join the WEEKLY THURSDAY 30-45 Min. Webex Training Starting @8:30AM PST. I will be presenting for the June 22nd session covering “EUC TestDrive Refresh & How to Demo Digital Workspace“, so make sure you come join the session!! Missed The Latest VMware Announcements In The Past Month? Check Out This Summary! Missed The Latest VMware Announcements In The Past Month? Have you been busy lately and haven’t keep up to date with the latest VMware announcements over the last month or two? If so, you have missed quite a bit! So I thought I would make it easy on you and pull together all the recent announcements related to product updates, acquisitions, promotions, partnerships, VMworld, Wanna Cry Ransomeware, etc. This summary has a lot of great information that you want to be aware. I highly recommend that you read through the full list of announcements to be sure you are aware of them. One link I would like to draw your attention to specifically is under “Security” which takes you to a VMware blog about the “WannaCry Ransomeware” attack that swept the world on May 12th, 2017 in over 150+ countries worldwide. The article discusses how VMware’s NSX solution and its “Zero Trust” model could have helped those that were attacked mitigate this attack. This just proves how important it is that businesses consider using VMware’s NSX solution to help protect their environments from attacks in ways that other solutions can’t. Because of this, all Hands-On-Labs (HOL) labs related to vCloud Air labs have been removed from Partner University and the public facing Hands On Labs (HOL) site. WannaCry Ransomware attack that attacks Microsoft operating systems swept the world on May 12th in over 150+ countries. Below is VMware’s response on how the NSX Zero-Trust model could have helped mitigate this attack using NSX. This is a great opportunity for you to drive how critical it is to use NSX and where other solutions couldn’t provide the same protection that we can from these types of attacks. On March 2nd 2017 we released the VMware Validated Design for Software-Defined Data Center 4.0. A milestone release in our commitment to delivering our customers standardized, proven, and robust data-center level designs for the Software-Defined Data Center. VMware ranks no. 11 on the list of Best Workplaces in Technology. The ranking was based on employees’ assessment of multiple categories. Our picks for the best of the best. Welcome to the Publishing Applications with VMware Horizon 7 Quick-Start Guide. This guide shows you how to quickly install and deploy published applications with VMware Horizon 7. Whether you are new to published applications or run an existing published applications environment, this guide takes you step by step through the installation and configuration of the key software components. In this field, credibility is everything and certification sets you apart from your peers. From now until December 2nd 9pm Pacific time, you can purchase selected VMware training courses from the VMware online store and save 25%. It’s been a couple of weeks since we open sourced Clarity. We’re overwhelmed by the positive response we’ve seen so far and extremely happy to be able to share what we have been working on for the past year or so. Today we’re ecstatic to announce Project Clarity, a design system that combines UX guidelines, patterns, and front-end code in one solution. Clarity is for the designer and developer in each of us. Explore & play with the latest Flings from VMware! Flings are apps and tools built by our engineers that are intended to be played with and explored. vExpert 2017 Applications are Now Open! Applications for the 2017 vExpert program are now open. Applications will be accepted until December 16th at midnight PDT. The vExpert 2017 announcement will be on February 8th 2016. Current 2016 vExperts need to apply through the fastrack application only. I’ve been spending some time lately figuring out ways to improve the monitoring and alerting within VMware’s Internal Horizon environments. A condition I wanted to alert on was DHCP scope exhaustion. 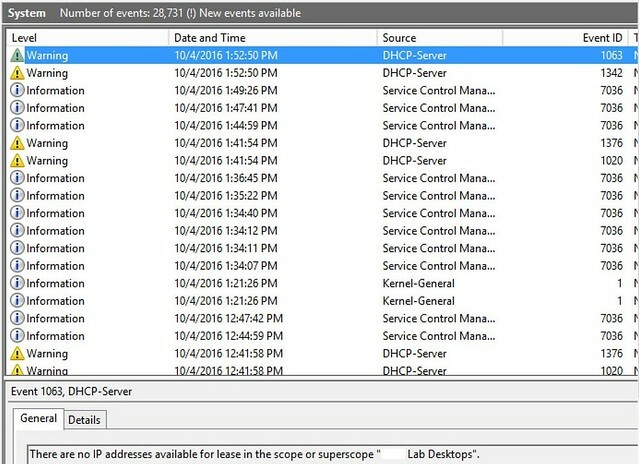 We have many DHCP scopes globally for our virtual desktop environments and I want our support team to be alerted when we start to run low on DHCP IP addresses and in a worst case scenario, exhausted all IPs in the scope. Virtual desktops without IP addresses don’t tend to work very well. In theory, we should never exhaust our DHCP scopes if we size and place our desktop Pools correctly. However, in practice that doesn’t always happen. Often a Pools get created with the wrong amount of desktops or the wrong network was selected on the Golden Master image, causing the new Pool to use the wrong DHCP scope. I want to know when these mistakes have been made, so we can correct them before our end users are affected. Within our Horizon environments, we utilize vRealise Log Insight for log collect and analysis. My knowledge of Log Insight is still pretty primitive, so I engaged one of my OneCloud colleagues, Caleb Stephenson, who manages our Global Log Insight instance that processes 35 Billion events per week to figure out how we can achieve this. 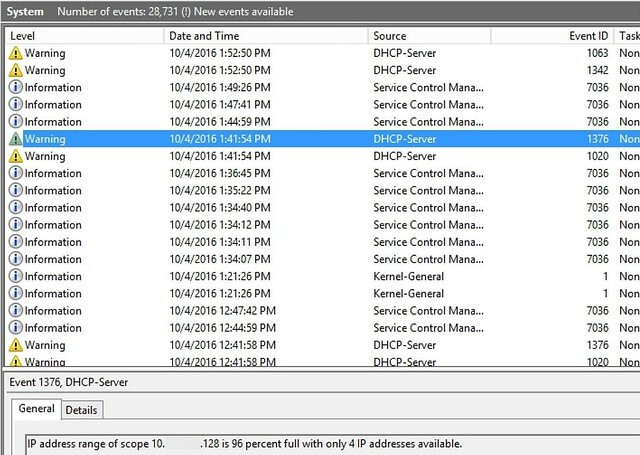 We use Windows based DHCP servers, so the first thing we needed to do was to figure out if the DHCP service logs the information we are looking for. Lucky in our case, it does. In two places. In the DHCP logs (C:\Windows\Sysnative\dhcp). However, these are only created daily, which wasn’t dynamic enough for our needs. The other place is in the Windows System Event Logs. Below are a couple of screenshots of the System Log entries that we are interested in alerting against. So now we know where the data is, Caleb needed to figure out a way of capturing that information and alerting on specific conditions. I’m not going to go into depth on how this was achieved as Caleb documents it and also does a really good job of explaining the process on his blog post: Getting Fancy with Log Insight Alerting (aka. Monitoring DHCP pools via logs) However, I will share the high-level steps. Check out the new RESTful API and fully module-based PowerCLI in vSphere 6.5! The post VMware Gets Serious about RESTful APIs and Expanding PowerCLI appeared first on Wahl Network. As we look back over the last year, it’s been an incredible ride for VMware’s End-User Computing team. We introduced VMware Workspace ONE in February to transform the delivery of secure digital workspaces to workers on any device anywhere. The feedback has been extremely positive, with organizations like American Red Cross using Workspace ONE to […] The post Introducing VMware Workspace ONE Essentials appeared first on VMware End-User Computing Blog . VMware, Inc., (VMW) and GigaSpaces today announced a collaboration to advance open, standards-based orchestration for network functions virtualization (NFV) applications. The availability of TOSCA (Topology and Orchestration Specification for Cloud Applications)-based Cloudify from GigaSpaces to support the VMware vCloud® NFV™ Platform provides customers choice in open NFV orchestration for Telco Cloud environments. Attending VMworld 2016 Europe or not, follow the official social stream for all the latest conference & community buzz. Check Out This List of Links Of Blogs Related To VMware Solutions! Check Out This List of Blog Links Related To VMware Solutions!